​CRASIAN. A HYBRID FOOD. NORTH AMERICAN STREET FOOD MEETS ASIAN. BI-CULINARY. IT'S "I CAN'T DECIDE BETWEEN FAST FOOD OR TAKE OUT". IT'S SAVOURY. IT'S SALTY. IT'S SWEET, SOUR & SPICY. IT'S EVERYTHING YOU'VE EVER WANTED. IT'S FUN. IT'S CRAZY. IT'S THE BEST OF BOTH WORLDS. HOME-MADE. FRESH. CRAVE-ABLE. CRAZY ASIAN STREET FOOD. ANY QUESTIONS? 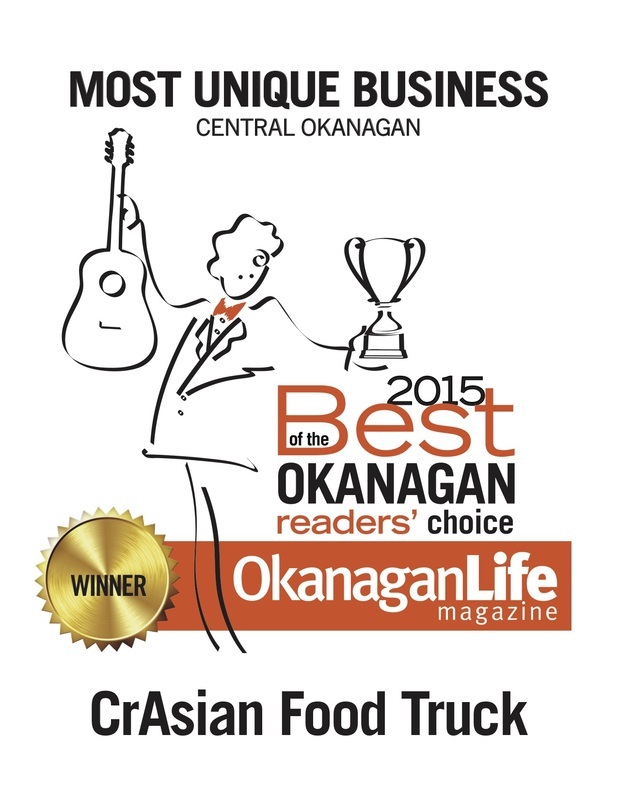 2018 Best of the Okanagan "Food Trucks"
follow us online to stay up to date on events, schedule changes and all the exciting news!